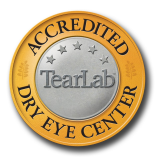 The TearLab osmolarity test utilizes a temperature corrected impedance measurement to provide and indirect assessment of osmolarity. The TearLab osmolarity system pen is designed to hold the test card and facilitate pain-free, simple tear fluid collection. Using a mechanical/electrical interface, the pen is able to convey data to the TearLab reader automatically when docked. Why is it important to diagnose and treat dry eye disease?